The deadly attack occurred during Bastille Day celebrations in south of France. The suspected terrorist who killed dozens of people -- including at least 10 children -- by plowing a truck into a crowd in France during Bastille Day celebrations Thursday night has been identified by officials as 31-year-old Mohamed Lahouaiej Bouhlel, who was unknown to French security services. Bouhlel, who was born in Tunisia, lived in Nice with his wife and worked as a delivery driver, officials said. He was killed in a shootout with police from his 18-ton vehicle. Fingerprints confirmed Bouhlel's identity and his wife has been detained since this morning, French prosecutor Francois Molins said at a news conference today. Officials recovered an automatic handgun, grenade and ammunition from his truck, among other weapons and items. Investigators seized computers and cellphones during searches at two different addresses, Molins said. 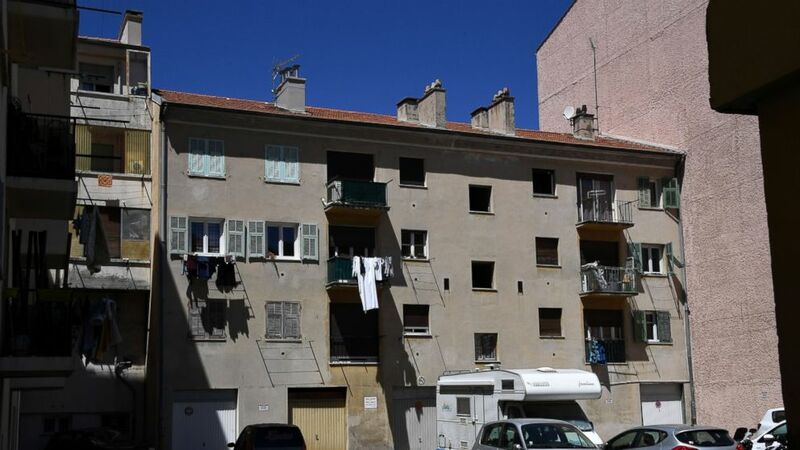 Although Molins said the man was "entirely unknown by intelligence services" and had no file of radicalization, Bouhlel was sentenced in March to a six-month suspended prison sentence for use of a weapon. That case involved him and another motorist and the weapon was a piece of wood, officials said. 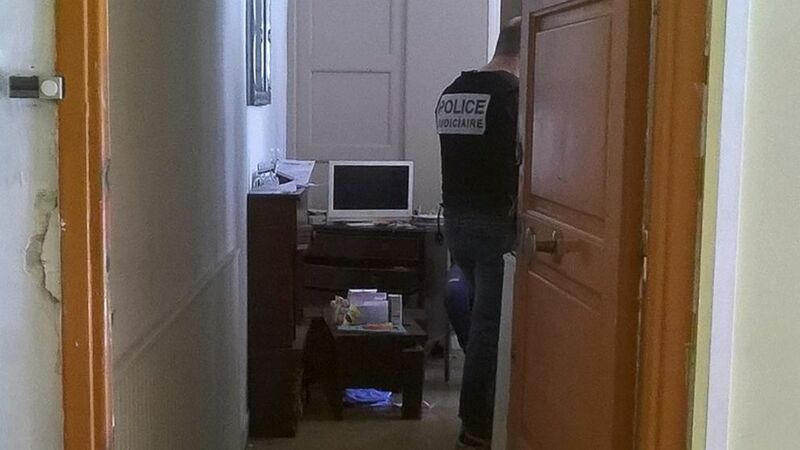 (Anne Christine Poujoulat/AFP/Getty Images) This photo taken July 15, 016, shows an apartment that was searched in connection with the suspect of the attack in Nice, France. (Catherine Marciano/AFP/Getty Images) French police officers look for evidence in an apartment following the attack, July 15, 2016, in Nice, France. Two Americans were among the at least 84 killed in the attack, when the driver mowed down a large crowd with a truck hauling grenades and other weapons during Bastille Day celebrations in Nice, the U.S. State Department said. Officials did not name the two Americans, although family members confirmed their identities to ABC News. Sean Copeland and his 11-year-old son Brodie, who were in Nice on a family vacation, were killed in the attack, Alyssa Weaver, the elder Copeland's niece, wrote on Twitter. The Copelands are from Lakeway, Texas, about 30 miles west of Austin. Three UC Berkeley students studying abroad in Nice were injured in the attack, the university said. One student sustained two broken legs and another had a broken foot. Another UC Berkeley student, 20-year-old Nicolas Leslie, is still unaccounted for. France's prosecutor said that in addition to those killed, including 10 children, more than 200 others were injured. Among them, 52 were in critical condition. The driver was shooting out the window as he slammed his vehicle into crowds for over a mile along the Promenade des Anglais, officials said. He was shot by police while firing his gun through the window, they added. Images of the truck showed the windshield riddled with bullet holes. Witnesses described how a festive night watching fireworks on the seafront for the French holiday ended in horror. Shortly after the fireworks ended, Inga Romanoff was walking down the promenade when she heard gunshots. "I started running and I looked back and I saw the truck going through the people right in the place where I was standing. It was just seconds," Romanoff said on "Good Morning America" today. "I don't think people had any time to jump out of the way." Chaos erupted as people tried to flee the driver's deadly path, Romanoff said. A woman next to her stumbled and fell, she said. "People kept running over her, and I was trying to pick her up so she could also run." It was complete chaos," she said. "People were running in different directions." (AFP/Getty Images) Forensics officers and policemen look for evidence near a truck on the Promenade des Anglais seafront in the French Riviera town of Nice on July 15, 2016, after it drove into a crowd watching a fireworks display. Sam Helwani, a French teacher from New Jersey, was with friends further from the scene when they saw a crowd running in their direction. "It was like a mass exodus of people running towards us," Helwani told ABC News today. "I had asked a woman in French, what’s the problem? What’s going on? And she said there’s a man with a gun." Helwani, who has traveled to Nice for the past six years, said he's still shaken up by what happened, but won't let it impact the rest of his trip. "I still can't eat anything. I'm still a little shaky," he said. "I'm here until the end of August so I have a really long trip planned and I'm not going to stop doing what I do." 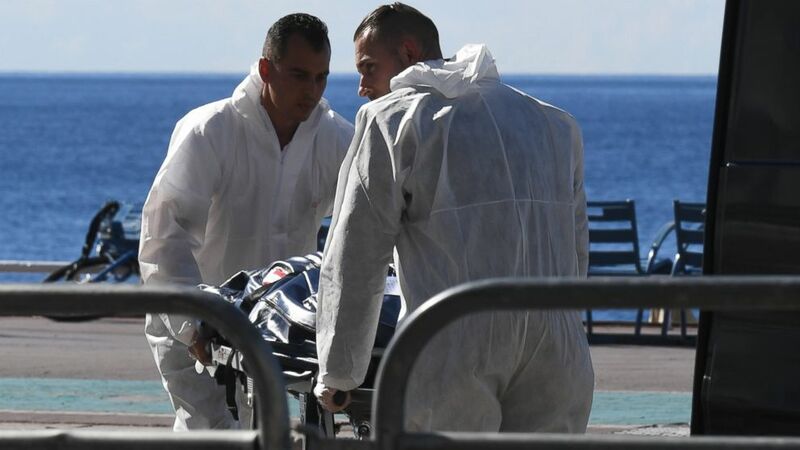 (AFP/Getty Images) Forensics experts evacuate a dead body on the Promenade des Anglais seafront in the French Riviera town of Nice on July 15, 2016, after a gunman smashed a truck into a crowd of revelers celebrating Bastille Day. French President Francois Hollande extended the country's state of emergency, which was due to end this month, for another three months and was mobilizing reservists. He said it was unclear whether the attacker had any accomplices. 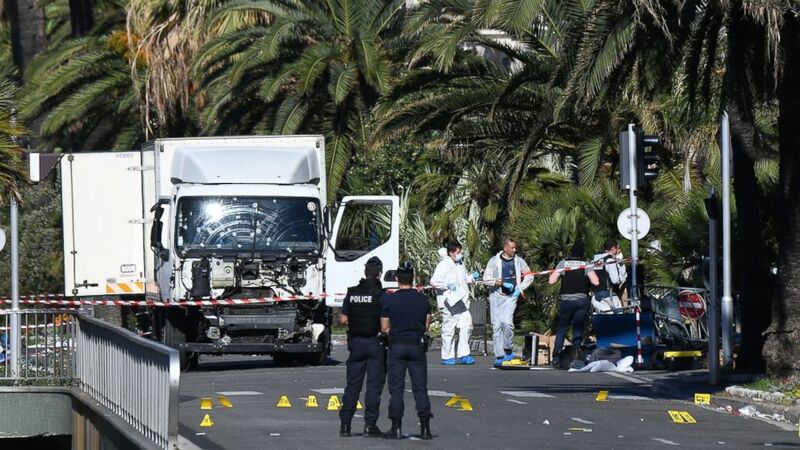 "France is horrified by what has just occurred -- a monstrous act of using a truck to intentionally kill dozens of people celebrating 14th of July," the French president said during a nationally televised address early today. "France is strong. France will always be stronger than the fanatics who want to strike France today." Officials said there have been no claims of responsibility. The Paris anti-terrorism prosecutor's office was put in charge of the investigation. 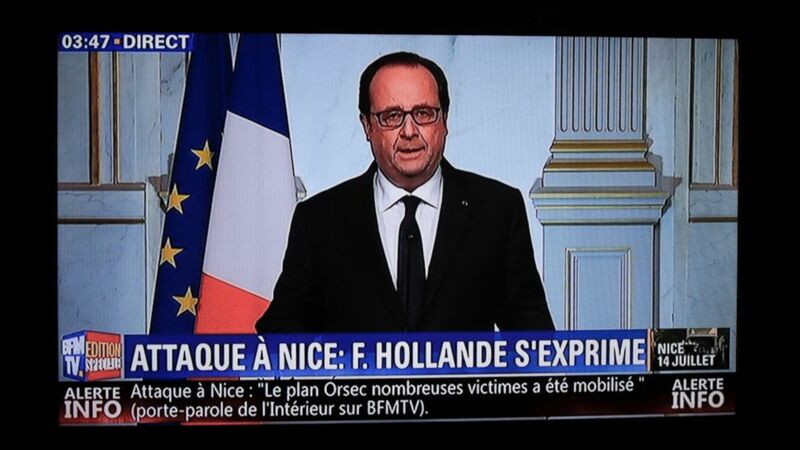 (AFP/Getty Images) This still image from a BFM TV telecast shows French President Francois Hollande speaking about the attack in Nice on July 14, 2016 in Elysee, Paris. Graphic images surfaced on social media showing the mayhem, including the truck barreling through crowds as dozens are seen running from the scene. #????? #?????? #?????? #terror #nice #niceterrorattack #terrorattack #niceattack #terrorism ????? ????? ????? ??????? ???? ?? ????? ?????? ???????? ??????? ?????? ????? ? ?????? ?????? Pope Francis tweeted this morning that he was praying for the victims. I pray for the victims of the attack in Nice and their families. I ask God to convert the hearts of the violent blinded by hate. President Obama also issued a statement calling the incident a "horrific terrorist attack." Secretary of State John Kerry, who joined French leaders Thursday at Bastille Day celebrations in Paris, said he would continue to stand "firmly" with the French people during this time. French Prime Minister Manuel Valls said the government has declared three days of national mourning after the attack in Nice. Vallas said the national mourning would begin Saturday. ABC News' Louise Dewast contributed to this report.